Jan. 21, 1999: A NASA sounding rocket designed to study a region of Earth's atmosphere that is directly exposed to the solar wind blasted off yesterday from the Andoya rocket range in Norway. The the Cleft Accelerated Plasma Experimental Rocket (CAPER) soared to an altitude of 1360 km, 20 km higher than expected. 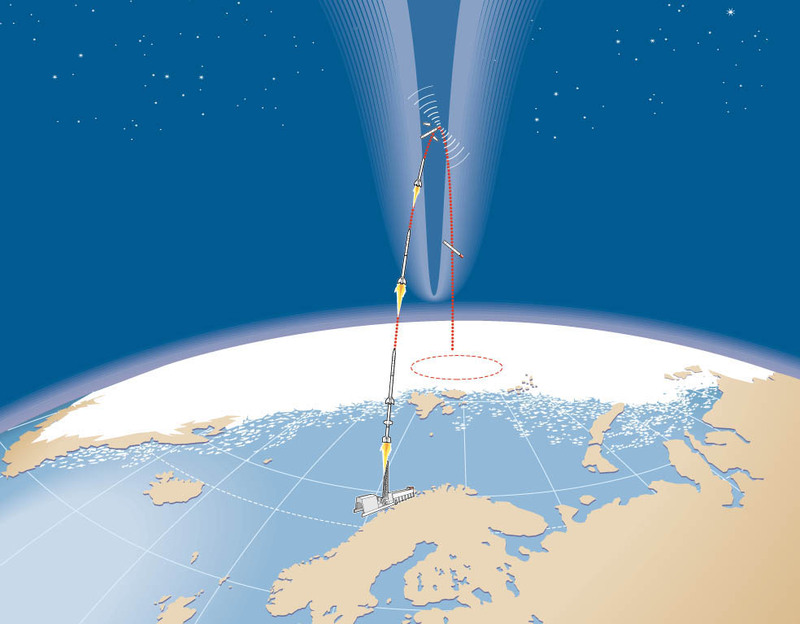 During its 20 minute flight the rocket flew over several auroral arcs, and passed through regions containing intense electric fields and highly accelerated ions. CAPER probably landed in the polar ice somewhere near the Longyearbyen tracking station in Norway. "It was a successful flight," wrote principal investigator Dr. Paul Kitner, in his daily CAPER update. "We wish to thank all of the many dedicated and talented individuals who contributed to the CAPER project." Just after the launch Prof. Kitner and his colleagues toasted the success of the mission with champagne before heading to the airport for their return to the United States. Supporting data were gathered during the flight by NASA spacecraft and satellites. 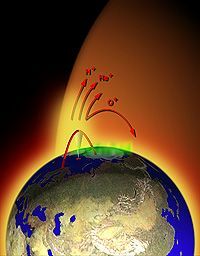 The Polar satellite monitored ultraviolet and visible light emissions from Earth's aurora from a perspective above the North Pole, while the ACE spacecraft measured solar wind fluxes and velocities. "The success of the CAPER mission could significantly advance our understanding of Earth's magnetosphere and of space weather," says Mr. Mark Adrian, a plasma physicist at the University of Alabama, Huntsville who helped build two of CAPER's instruments. "Yesterday, the sounding rocket flew through the so-called 'Cleft Ion Fountain' which is a major contributor to charged particles in the magnetosphere. There's a debate going on now among plasma physicists about the source of energy that drives the fountain's particle flow. No one is quite certain where the free energy comes from, but there are some good ideas. The data from CAPER should clearly distinguish between competing models and help us understand how the ion fountain really works." CAPER was funded by NASA and launched in collaboration with the Norwegian Space Agency, Andoya Rocket Range, UNIS. The GSFC/Wallop Flight Facility project manager was Dave Moltedo. For more information about the science of the CAPER mission please see Plasma scientists plan polar CAPER to study auroral ion fountain (Jan. 7). CAPER Team: Dr. Paul Kintner of Cornell University is CAPER's principal investigator, and oversees the instruments that are provided by several other institutions. The NASA/Marshall science team was led by Dr. Michael Chandler and includes Ms. Victoria Coffey of NASA/Marshall and Mr. Mark Adrian of the University of Alabama in Huntsville. Coffey and Adrian were responsible for the front-end electrostatic analyzers and calibration for the electron, TECHS, and ion, TICHS, measuring instruments. Dr. Craig Pollock of Southwest Research Institute was the lead for the TECHS and TICHS instrument team, which includes Dr. Thomas Moore of NASA/Goddard. Solar wind blows some of Earth's atmosphere into space. Dec. 8, 1998. Polar spacecraft measures "auroral fountain" flowing out as solar wind flows in. Earth weaves its own invisible cloak. Dec. 9, 1997.Polar fountains fill magnetosphere with ions. Plasmas can't hide from neutralized TIDE. Nov. 20, 1996. SCIFER's 1995 flight set the stage for CAPER. August 12, 1996. SpaceWeather.com daily forecasts of solar activity and current geomagnetic conditions.